Competition: Win The Coldest City! 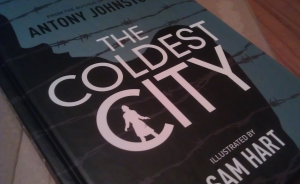 We have a copy of the beautiful, thrilling new hardcover graphic novel The Coldest City by Antony Johnston and Sam Hart – find out more about the book here – that you can win by entering our competition! 1: Where would Nick like to live, if it meant he didn’t have to work? 2: What is Jane’s one desire right now? 3: What was the awful voice that James apologised for? Please send your answers to MOMBcast@gmail.com by the closing date, 18:00 GMT 31st May 2012. This competition is open to anyone (except core MOMB team members and their partners), and the prize will be posted free to anywhere in the world.